A historical re-creation of the actual sword used during the 18th Century. Featuring a 29" blade constructed from 440 stainless steel. The cast metal pommel and guard surround the brown suede leather wrapped handle which coordinates with the brown suede leather wrapped hardwood blade sheath. 36 1/4" overall. It’s sharp, thin though, not full tang, decent handl, scabbard fits snug enough, lightweight, worth the price, but it’s big brother would snap this one in Half. Only $30.00 more! Nice to have both though. Personally, I like this sword. The balance is very good, the blade is thick and straight, and the sheath is fine. For someone who is not planning on invading Britain anytime soon, I'm happy with it. 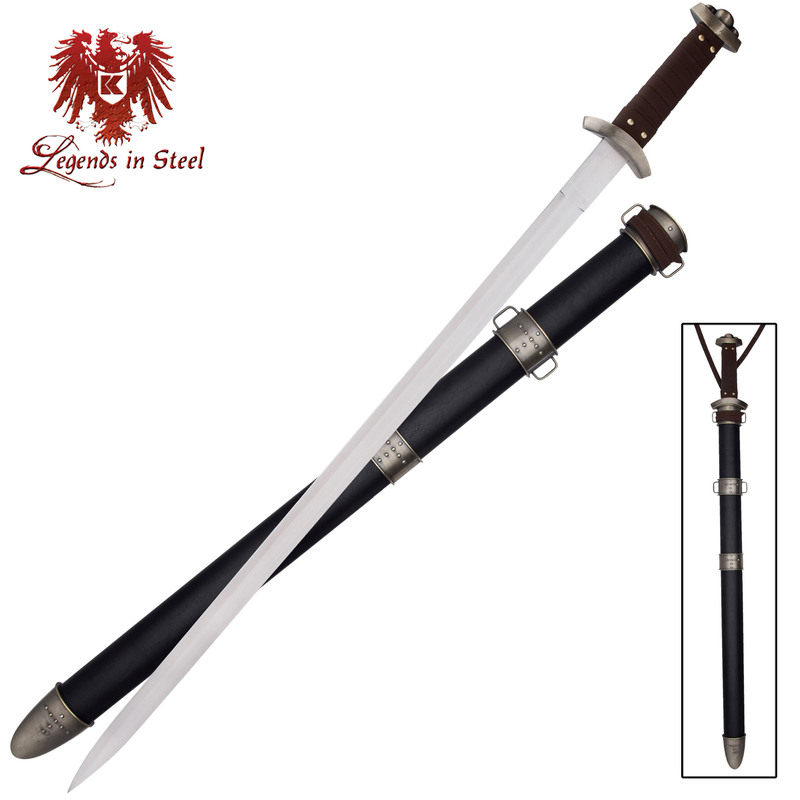 After all, what else can you do with any of these historically inspired swords but display and enjoy them? So, although I love this weapon I feel it only deserves three stars because of all of its imperfections. First off, the tip is uneven. Not a big problem, also the grinding of the blade wasn't straight. The pommel was off center. And as I believe someone else said the wrapping on the handle is coming off a little bit. However, with that being said I still absolutely love this sword. It has a perfect weight and just looks great. It looks pretty cool, but don't expect to get any use out of it for very long. The welding on the tang is terrible and will snap off easily. Other than that, It's fun to hold and wear on your hip and look like a badass. The good thing is that the blade is 440 stainless and reacts similar to a real Viking blade; if used with that fighting style it'll hold up, beyond that it has many problems. It is not full tang so don't try power strikes. The handle and sheath are wrapped bamboo so be careful. The leather work is of very low skill level (my 10 year old grandson dose better work and he learned last year). The antique finish on the guard, pummel, and sheath cuffs makes it look toyish and the upper two sheath cuffs are riveted to a negative cross style. The blade edge looks like it was filed with a flat wood rasp, it took several hours to grind the serrations down, it'll take several hours more for a presentable edge. The filler groove is of very poor quality and seems to be made with a stamp for a 6" or 8" knife. I'll fix it up and make a new sheath for it to hang on the wall. I expected for the price a sword that would be at least comparable to "Chaos", the sword I have been using for years and only paid $30 for and added a little love. For the price it should be either full-tang or presentable enough to display on the main room wall. A great buy for the cost! I've had it about a year now. The Blade: It is in fact 440 stainless steel although it is Chinese made. The factory edge was a diamond cut, but it didn't take much work to resharpen to a nice convex razor edge. (I use a 1 inch belt sander with ascending grits) being 440 the edge holds decently. Hilt to pommel: The "brown suede leather" is actually cheap fabric, so I immediately re-wrapped the handle with some nice veg tanned leather. The hilt and pommel are both cast metal, with a nice brass finish, and the pommel is held in place buy a hex screw. Sheath: Its made of cheap wood and more of that fabric, but it does its job, I haven't gotten around to replacing it with something of a higher quality. Useage: Its great for display certainly but it didn't hold up quite so well in practice. The edge held well with minor chipping when it strikes metal, but as I hit the practice dummy the pommel began to unscrew. Tightening it only served to crack and splinter the wooden handle. After about 20 minutes the threaded rod that the pommel is screwed to, broke, where it was welded to the tang. I've welded reinforcements to the tang and used a quality hard wood for the handle, haven't had any problems since. I just received my sword and am very pleased. It is clean, straight, solid, and paper-cutting sharp. This will be a prized display piece to my Norsk heritage. Just got this sword in the mail today. snow caused cancellations to delivery in my area so I got it in 5 days instead of 3. for the price the sword is excellent. the scabard and faux leather leaves something to be desired, but I can replace it with real leather gripping on my own. for the price it would make a great perchace for anyone. I read a few reviews that had said it was not bladed, but out of the box it could cut a sheet of paper. all in all I was very happy for the money.